TEN has acquired a package of natural history content from the BBC. They include the new three part series Hidden Kingdoms and brand new content from Sir David Attenborough: David Attenborough’s Natural Curiosities, Attenborough’s Ark. It also includes stand-alone docos Giant Otters of the Amazon, Snow Babies, Living With Baboons and Operation Iceberg. TEN Chief Programming Officer, Beverley McGarvey, said: “We are thrilled to continue our relationship with the BBC. To have acquired so many premier natural history titles demonstrates our commitment to this genre. From the series producer behind Planet Earth and South Pacific, Mark Brownlow, and the executive producer of Africa and Life, Mike Gunton, Hidden Kingdoms puts the microscope on tiny animals and their exciting lives using the latest filming technology, combined with innovative storytelling, up-close footage and an in-depth perspective on the natural world. In David Attenborough’s Natural Curiosities, Sir David Attenborough shares the stories of some of the most extraordinary creatures that have bewildered and continued to intrigue him – from the peculiar patterns of a zebra’s stripes to the evolutionary quirk of the egg-laying platypus. Each episode explores the stories behind two natural curiosities, linked together by a common theme. David’s gift for storytelling combined with wonderful images of the animal subjects creates a television series unlike any other he has made before. 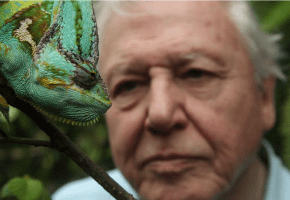 Attenborough’s Ark, sees Sir David Attenborough select ten of the most important and lesser known animals from the endangered species list that he would like to save – creatures like the olm, the solenodon and Darwin’s frog; creatures with bizarre adaptations and strange life history. From within the deep vaults of the Natural History Museum David shares his thoughts on extinction and introduces his chosen creatures. He explains why they are so important and shows the ingenious work of biologists across the world who are helping to keep them alive. Other premiere titles included in the package are: Giant Otters of the Amazon, which delves deep into the Peruvian Amazon to uncover the world of a remarkable family of giant otters; Snow Babies, which takes viewers on a worldwide journey to reveal how young animals learn to survive their first winter; Living With Baboons, which follows Matt Pines as he negotiates the safety of his Ethiopian baboon tribe who he has been living with for five years and Operation Iceberg, a ground-breaking all-action expedition, which sees a team of leading scientists race against time to discover the unknown world of icebergs.